I love old quilts! Their charm, a simple yet elegant design, the exquisite handwork or even a quirkiness can draw you in and provide a glimpse into the personality, lifestyle and aesthetic of a quiltmaker from another time. It's also exciting to see "remakes" of quilt patterns and piecing styles that have been taken from the archives and updated using today's tools and supplies. String Quilt Revival: A Fresh Approach for 13 Classic Designs is a book that does just that. 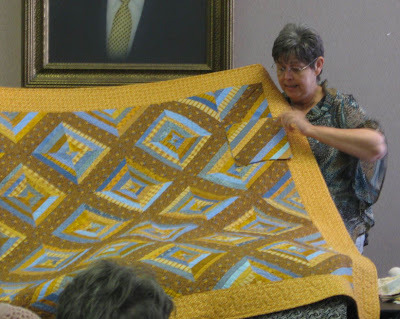 This week, my friend Sherry and I attended the Battlefield Piecemakers quilt guild meeting and a presentation by the co-authors of the book, String Quilt Revival . Virginia Baker and Barbara Sanders—or Ginger and Bobbie as they are called by their friends—are the authors of the book, and they have been traveling to various guilds and quilt shops promoting the book and offering classes on their string piecing technique. Growing up on a farm in Columbia, Tennessee, Ginger and Bobbie's zeal for quilting and the inspiration for the book came from the quilts their grandmother made. They share this history in their presentation and in their book. Try a log cabin layout for a string pieced quilt. They have updated the string piecing technique used by their grandmother, however, by substituting the traditional paper or muslin stabilizer with a leave-in mesh stabilizer. This eliminates the tedious step of removing the paper or newsprint once the piecing is complete (a real time-saver!). The stabilizer, available through their website, is lightweight, washable and has no stretch or bias. 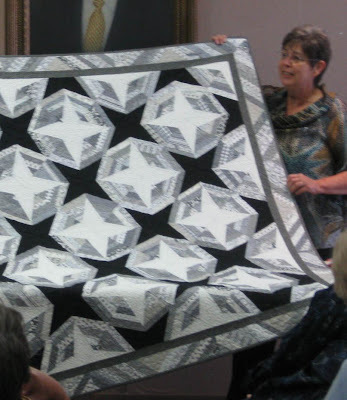 Ginger shows an example of where the individual quilt block fits into the layout. 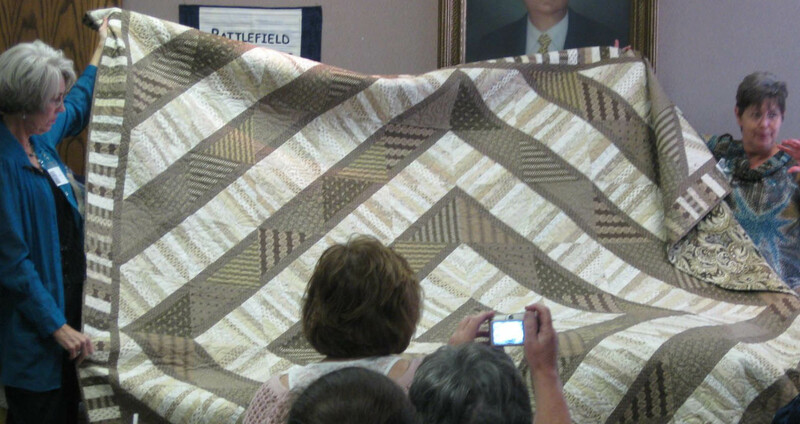 As they discussed their technique, attendees got to see the quilts from the book in person. The quilts illustrated how different patterns can emerge just by rotating the blocks, changing the placement of color values, or using an interesting print or stripe to create spectacular compositions. A wiggly striped fabric makes the stars spin. As with most long-time quilters, both women had an extensive fabric stash. 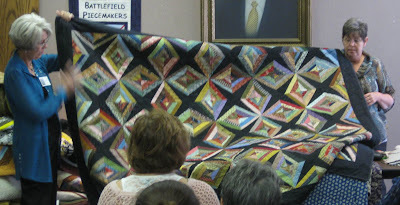 They exercised these fabric collections in making the string quilts for the book and shared the stories about the fabrics and the quilts. 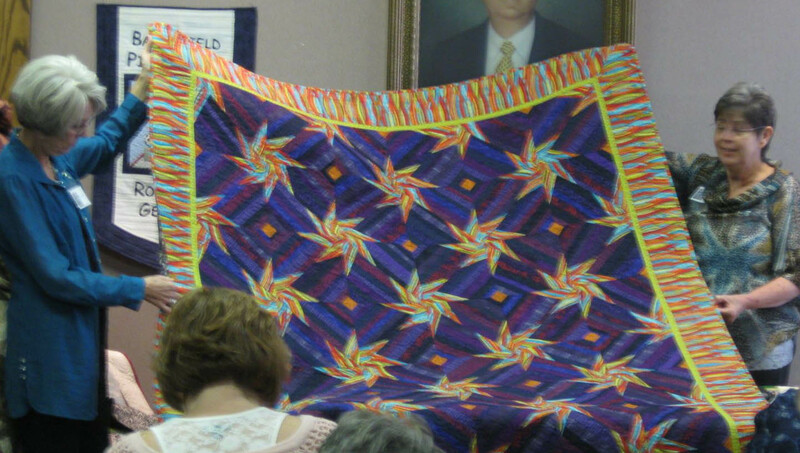 In their presentation, they emphasized the use of a plethora of fabrics in both the traditional quilts and the modern versions, illustrating that this variety is what provides the interest and visual excitement to these pieces. As a fabric rep, I'm imaging the endless possibilities for creative, colorful and interesting designs that today's fabric selection would afford quilters. Even if you have a goodly stash (as most respectable quilters do), incorporating a fabric or three (or five!) from a current line would provide a fresh, unexpected or unifying element to your design and bring your composition to a new level. And, sometimes, you just have to infuse your stash with a new source of inspiration and spice. Which stars do you see? The white ones or the black ones? I'm glad I had the opportunity to spend an enjoyable evening with friends and fellow quilters. 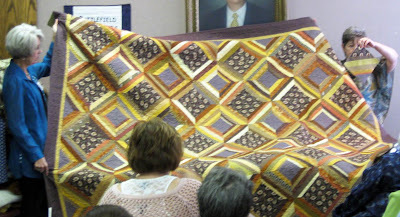 The String Quilt Revival presentation and the book (which they autographed for me) got the wheels turning! What was old is new again. Pick up a copy of the book, pull out your scraps, buy a yard or two of a new focus fabric, and try this updated technique of a tried-and-true design!